Learn more about Andorra’s public transport. 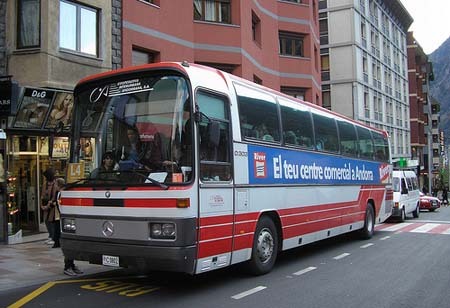 There are two regular bus lines connecting the parishes of Andorra. Their main stops are located in the most popular streets of the main urban centers of the country. This kind of line links all the towns of the Principality of Andorra with a total of six routes that cross these urban nodes. It is important to know that each parish features a common transport service that links all the small populations not covered by the main lines. These stops tend to be in the major streets and main avenues. This is the fastest and most common bus line that links the main urban nodes and parishes with Andorra la vella. Its route tends to go along secondary roads to avoid urban centers and traffic jams. The buses are color orange and its stops are located are outside urban centers. Sant Juliá de Lória - Escaldes-Engordany. Day pass without ride limit: 4 Euros. Weekly pass without ride limit: 22 Euros. Monthly pass without ride limit: 70 Euros. 10 ride pass(T 10): 12,50 Euros. Monthly pass without ride limit: 100 Euros. Monthly pass without ride limit:125 Euros. Monthly pass without ride limit: 150 Euros. You can also be interested in using a touristic bus, which features several routes along the most interesting areas of Andorra. The estimated prices for the touristic bus is around 12 euros for a ride, and 18 for two. Buses tend to run between 7am and 9pm.